The story: Ty is a big, fierce tyrannosaurus who is about to go get some breakfast. His efforts are thwarted by his baby sister, Teri, who shows up at the worst possible moment for a snuggle. Will Ty ever get something to eat or will a threat to his baby sister make him rethink just how annoying she is? Mama opines: I have to confess that I picked this up because it's about a dinosaur and his little sister. I obviously don't expect that David will have a dinosaur sister in May, but it doesn't hurt to read as many brother/sister stories as we can get! 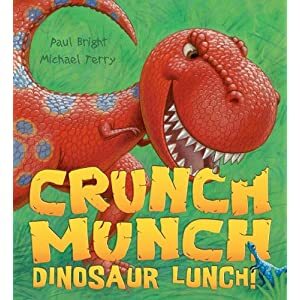 This book hits a great balance between a sibling's frustrations and a fun book about dinosaurs. 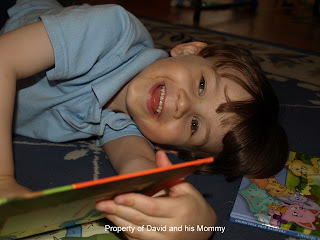 Thoughts from David: I like it because he roars his terrible roar. I like it because he stomps through the swamp. Favorite part: When he says, “I’m biggest, I’m baddest, and I need a treat! Diplodocus steak looks tasty to eat!"